Most Americans do not put the state of the economy at the heart of everything else is occurring. Instead they listen to politicians apply the blame to everything other than themselves. President Obama spent his entire first term blaming George W. Bush for the bad state of the economy he inherited, but instead of addressing it, he increased it by imposing ObamaCare, radically altering how many would be hired while others were cut to a part-time status. The bill added a number of taxes as well. When 2015 arrived in January CNS News reported that “A record 92,898,000 Americans 16 and older did not participate in the labor force in December, as the labor force participation rate dropped once again to 62.7 percent, a level it has not seen in 36 years,” according to the Bureau of Labor Statistics (BLS). Remember those unemployed young blacks? In March the BLS noted that a record of 12,202,000 black people were not in the labor force. The unemployment rate for black people in March was 10.1 percent, which is nearly double the overall unemployment rate of 5.5 percent. For black teens, age 16 to 19, the unemployment rate was even higher at 25.0 percent, meaning that one in four black teens who were actively seeking a job did not have one. Also in April, the BLS reported that “a record 56,131,000 women, age 16 years and over, were not in the labor force the previous month, as the participation rate for this group dropped to 56.6 percent—a 27 year low. “’The executive branch is operating a high parallel work-authorization system outside the bounds of the (immigration) laws and limits written by Congress (and which) inevitably reduces job opportunities for Americans,’ said Jessica Vaughan, the policy director at the Center for Immigration Studies” which filed the FOIA request the revealed this travesty. So it didn’t matter to Barack Obama that millions of Americans were out of work while the White House masterminded a secretive program to provide non-Americans access to the jobs that were available. The record speaks for itself. Americans are worse off today than when Obama took office in 2009. In the years since then he has totally failed to take the best understood steps to push back against a recession and unemployment. He has expanded the federal government. He has failed to initiate a reform of the nation’s tax code to stimulate investment and expansion. The nation’s first black President has so poorly served the interests of the African-American population that they are worse off today. He has practiced “equal inequality” by afflicting our other demographic groups, younger workers, woman, and everyone else who has been left unable to afford college and unable to purchase a home and start a family. These years will be seen in retrospect as a desert of opportunity. As this is written, Americans are growing increasingly concerned over the outcome of the negotiations with Iran. Obama’s chief of staff, Denis McDonough, has written to Bob Corker (R-TN), the chairman of the Senate Foreign Relations Committee, harshly criticizing the notion that the Senate should have anything to say regarding the negotiations and suggesting that Obama has the authority to lift the sanctions imposed by Congress on Iran. He doesn’t. The Earth is not in peril, only the truth and common sense is. Would you vote for a man who openly says he would repeal ObamaCare? Would you vote for a man who openly says he favors a fair tax and wants to abolish the Internal Revenue Service? Would you vote for a man who opposes Obama’s efforts to offer illegal aliens amnesty and promises to secure the borders? Would you vote for a man who decries a federal government “that wages an assault on our religious liberty”? Would you vote for a man who wants a federal government that “works to defend the sanctity of human life” and would “uphold the sacrament of marriage”? Would you vote for a man who defends our Second Amendment rights and condemns the effort ban ammunition? Would you vote for a man who condemns a federal government that seeks to dictate school curriculums and wants to repeal “every word of Common Core”? Would you vote for a man who would stand “unapologetically with the nation of Israel”? Would you vote for a man who has pledged that he would do everything he could to ensure that Iran does not acquire a nuclear weapon? Would you vote for a man who openly says he would do everything he could to defeat radical Islamic terrorism? I said I would on May 6, 2013 when he was beginning to get attention. Columnist George Will said he was “as good as it gets” when it comes to being a true conservative in Congress. I am of course speaking of Sen. Ted Cruz (R-TX) who has announced his candidacy to be the presidential candidate of the Republican Party. I suspect that his announcement probably terrifies the Republican “Establishment” who have managed to serve up some good men, but poor candidates, to be President. When Republican voters stayed home, we got Barack Obama in 2008 and 2012. Now they want to get the Party faithful to vote for Jeb Bush, but from my vantage point, the real base is ready to vote for anybody else, Sen. Cruz, Wisconsin Gov. Walker, and Sen. Rubio come to mind. First of all, there is no Tea Party in the sense of a political party with its own candidates. What there is are Republicans who believe in the U.S. Constitution, small government, fiscal prudence, strong national security, and all those other values outlined in Ted Cruz’s speech at Liberty University in Lynchburg, Virginia. As Cruz said in an email about his announcement “Washington, D.C. has become completely disconnected from the values of real Americans. That’s why we are now more than $18 trillion in debt, why wages have stagnated, and why our foreign policy is an absolute mess.” That pretty much sums up what Obama has delivered. Does it surprise anyone that Cruz’s candidacy was instantly attacked, not just by Democrats, but by a number of leading Republicans? Rep. Peter King, appearing on CNN’s “Situation Room” with host Wolf Blitzer, said, he’d “jump off that bridge” when he got to it if Cruz becomes the GOP candidate. He also accused Cruz and Rand Paul of being “counterfeit conservatives.” Nonsense! The March 24 Wall Street Journal had a lengthy editorial devoted to “The Cruz Candidacy” noting that on most issues with the exception of immigration they found themselves in agreement with him and offered an upbeat view that “The good news for GOP voters is that their field of candidates in 2016 is going to be deep, offering many varieties of conservative leadership” but ending with reservations about “his polarizing style” which was another way of saying he is not a wishy-washy centrist. We will hear more such accusations and criticisms and, as often as not, they will come from the GOP Establishment. The GOP Establishment regards real conservatives as unable to secure election, preferring RINOs, Republicans in Name Only, and candidates who move as close to the center politically as possible. It seems to have escaped their notice that the Republicans elected in the last two midterm elections were sent to Washington, D.C. by Tea Party and other serious conservative voters. It has been a long time since a real conservative Republican, Ronald Reagan, was elected President, but it can happen again as serious voters, particularly those who are independents, join with those who find Sen. Cruz a refreshing voice, Will he get the nomination? We are a very long way from the 2016 election, but at least we know it won’t be a boring one! President Obama made no secret of his displeasure that Benjamin Netanyahu was reelected to be Israel’s Prime Minister. Only David Ben Gurion, Israel’s first Prime Minister and one of the nation’s founders, served longer. Obama lives in some parallel universe apart from the lessons of history and the realities of what is actually occurring. On May 18, 2009, not long after Netanyahu had been in office and was visiting the White House, Obama was demanding that he endorse Palestinian statehood and freeze the settlements on the West Bank. Considering that the Palestinians had refused statehood from the day the United Nations endorsed Israel’s independence that has been a fool’s mission no matter who was President or Prime Minister. As for Obama’s demands about settlements, who is Obama to tell the Israelis in 2009 where and if they can build the housing needed for its growing population? And yet Netanyahu, seeking to accommodate Obama, endorsed Palestinian statehood shortly thereafter and then announced a ten-month freeze on settlement development. What did Netanyahu get in return? Nothing. In 2014 when the Israelis responded militarily to months of rocket attacks from Gaza, it contacted the Department of State to request Hellfire missiles and Obama reportedly personally blocked the shipments. Netanyahu’s speech to a joint meeting of Congress left the White House deeply angered and his reelection probably stunned them. The Israelis are accustomed to being underestimated. 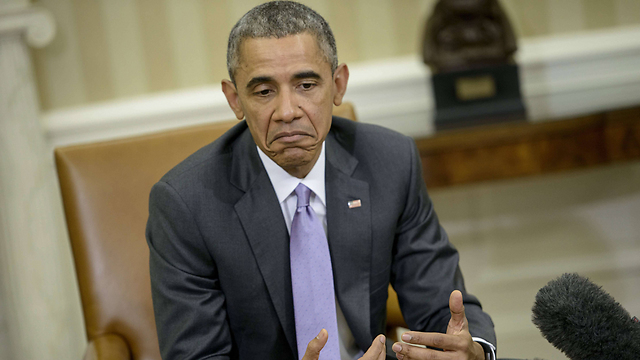 At this point, Obama has given plenty of evidence that he is both pro-Islam and anti-Israel. Michael Haltman has written a timeline of events, “Obama’s Israel Hatred”, that reflect Obama’s attitudes in terms of the people with whom he associated before his 2008 run for the presidency and the events that followed thereafter. The question of anti-Semitism is complicated by the fact that Obama has surrounded himself with Jews in the White House. The Secretary of the Treasury, Jack Lew, is Jewish. As is Gene Sperling, the Director of the National Economic Council. Janet Yellen, the Chairwoman of the Federal Reserve is Jewish as is a senior advisor, David Plouffe, as well as a dozen others. Rahm Emanuel, Obama’s former chief of staff is Jewish as was his former senior advisor, David Axelrod. At least fifteen other Jews formerly held high office in the administration. For anti-Semites, that would be “proof” that the White House is “run by Jews”, but that would not only be absurd, it would ignore the Muslims that Obama has put into positions of power and influence throughout his administration. Obama’s Jewish personnel choices all share his very liberal views. I define anti-Semitism as a serious or general dislike of Jews. It can be either overt or covert. As in most cases in life, you can make your own conclusion based on a person’s actions, not words. There is little doubt, however, that Obama shares an antipathy to Israel that is widespread among world leaders and many others. After two thousand years, the reemergence of Israel as a sovereign state in 1948 has no doubt baffled and irked those who hold Jews in contempt. Up until the election of Obama Israel had been supported by whoever was in the White House and understood to be an ally. Now that he is in the final years of his presidency, Obama does not have to hide his antipathy to Israel, nor did he make much effort to do so in this first term. The White House suggestion that they might take the two-state issue to the United Nations Security Council reflects Obama’s pique over Netanyahu’s speech to Congress opposing the Iran nuclear deal and his reelection. By contrast, his Palestinian counterpart, Mahmoud Abbas, is now in the 11th year of his four-year term. Who needs elections in Palestine? And the Palestinian Authority is now linked with Hamas, the Gaza-based terrorist group. Seeking United Nations involvement is a last ditch effort to harm Israel, but it hardly matters what the United Nations does or does not do because it is the most obscenely anti-Israel international institution. What troubles most people, irrespective of any real or assumed anti-Israel or anti-Semitic element, is Obama’s pursuit of a deal with the Iranians that would permit them at some point to make their own nuclear weapons. It quite simply makes no sense to anyone except Obama. Iran has made no secret of its wish to “wipe Israel off the map.” Netanyahu left no doubt that Israel would use military force to destroy Iran’s nuclear weapons facilities. In the past they destroyed such facilities in Iraq and Syria. As for the Iranians, they don’t care how the negotiations turn out. They have gotten a respite from the sanctions and had funds that were frozen returned; securing money and time to continue their nuclear ambitions. As for the destruction of Israel, Iran has both Hezbollah in Lebanon and Hamas in Gaza as their proxies to threaten Israel, so they can wait for a nuke to finish off the job. And who did the U.S. just remove from its list of terrorist nations and groups? Iran and Hezbollah! I suspect that once Obama returns to civilian life, we will learn more about his views about race and religion. What we have learned at this point is that he doesn’t like an America that is a world power and the leader of the free world. His policy of retreat has caused allies and enemies alike to distrust him. Anti-Semitic? Anti-Israel? Regrettably his words and actions demonstrate that this can be said of Obama with relative ease. Comments Off on Is Obama Anti-Semitic? The wounding of two police officers in Ferguson, Missouri, and earlier in New York City the assassination of two police officers are disturbing events for all Americans as they represent a hostility that threatens a safe, secure society wherever one lives. Shooting police is an invitation to anarchy. That there have been protests and parades of late advocating this should be a matter of deep concern to all of us, no matter our race. Ferguson, however, is NOT America if one looks at its population and the incredibly poor governance they have endured. You get the government for which you vote or when you neglect to vote. As noted in the Department of Justice report of an investigation occasioned by the shooting of Michael Brown by a white police officer, local governance was a factor in the lives of its black citizens that has invoked protest and resentment. “Ferguson,” notes Langston, “is unusual in the degree that the city uses the municipal court system and the revenue it generates as a way to raise city funds. This created a financial incentive to issue tickets and then impose excessive fees on people who did not pay.” For the record, this occurs in other comparable communities. What the media has reported regarding the number of blacks killed in police shootings is a bit deceptive. There is no question that “the disproportional number of blacks that are killed in police shootings”, says Langston. “Blacks comprise 13 percent of the U.S. population, but represent 32 percent of those killed by police between 2003 and 2009.” That’s more than double the number of whites killed. Now factor in the greater number of criminal events that bring together blacks and the police responding to them. Being black in America inherently evokes the historical fact that this nation practiced slavery prior to and since its founding in 1788 when our Constitution was ratified, to Lincoln’s Emancipation Proclamation in 1863. It wasn’t until 1964 when the Civil Rights Act was passed, followed by the Voting Rights Act in 1965 that the discrimination affecting the black community was fully addressed. Two generations of Americans. black, white and other racist groups, have been born since then and these new generations have no living memory of the Civil Rights movement or the riots that occurred in cities like Los Angeles and Philadelphia. Between 1955 and 1977 there were more than thirty race riots in America. Younger Americans did not experience them. Older Americans recall them and the protests in Ferguson evoked disturbing memories. As reported in a 2007 study released by the National Urban League, “African-American men are more than twice as likely to be unemployed as white males. They are nearly as likely to be incarcerated, with average jail sentences about 10 months longer than those of white men.” Between the ages of 15 and 34, the civil rights group noted that “black males are nine times more likely to be killed by firearms and nearly eight times as likely to suffer from AIDS.” The unemployment rates are comparable to those today, eight years later. One might conclude that murder is rampant in America, but the reality is that homicides are at a 50-year low. The peak homicide rate was in 1980. The rate began to grow in the mid-1960s, but steadily dropped by the 1990s. Today’s murder rate is at the lowest point in the past century. “Black youth culture is boiling over with nihilism. It embraces failure and frustration, including random crime and jail time,” wrote Williams. 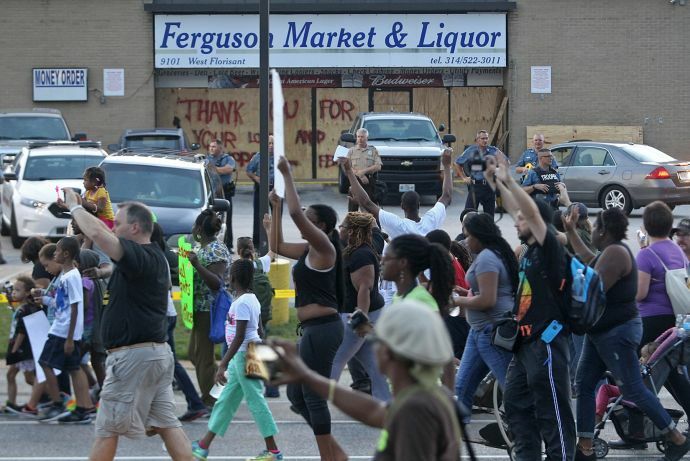 Ferguson is an example of far larger problems that afflict the black community. Only blacks can solve these problems. One might have thought—and many did—that the election of America’s first black President was going to make these problems go away. Many blacks have entered the middle class, but the majority encounters the problems endemic to the black community and, until its culture and lifestyle choices change, those problems will be around for a long time to come. ObamaCare got such a cold reception nationwide that 34 States refused to set up an exchange, forcing the feds to do it. Those exchanges distributed subsidies to individuals participating in them, but the ObamaCare statute “seemingly did not authorize subsidies in such cases.” Suffice to say that ObamaCare health insurance is considerably more costly than what one could have previously purchased on one’s own; thus the need for the subsidies gambit. The February edition of Health Care News, published by The Heartland Institute was filled with articles attesting to the failure of ObamaCare. Here are a few excerpts from them. ObamaCare is on critical care because it could die at any time. Not surprisingly, three Republicans, John Kline, Paul Ryan, and Fred Upton, chairmen respectively of the House Committee on Education and Workforce, Ways and Means, and Energy and Commerce, have put together a plan to address the likelihood that the Supreme Court decision will put an end to ObamaCare. What a unique idea! Let people choose the health care plan they want and that they can afford. That’s the way it used to be before the Affordable Care Act was passed entirely by Democrat votes because the GOP would not support it. That’s why Congress is controlled by the GOP these days. And that’s why this nation will return to the free marketplace.